You are invited to attend the fourth annual OutSummit on Saturday, December 8th, 2018. 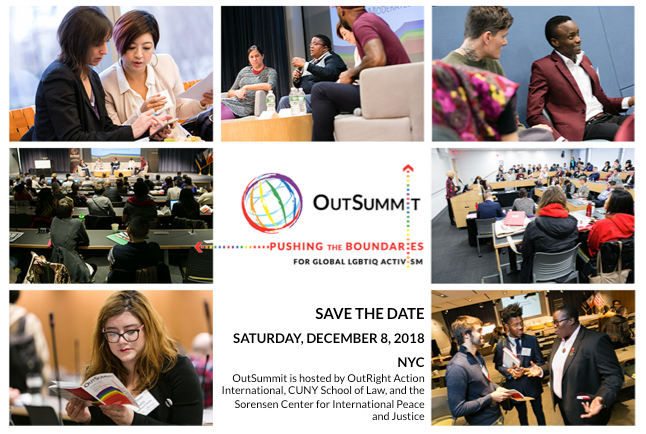 OutSummit is a one-day conference, hosted by OutRight Action International, a global LGBTIQ Human Rights organization, co-hosted by CUNY School of Law and the Sorensen Center for International Peace and Justice. OutSummit brings together international and US-based LGBTIQ activists for a day of panels, keynote speakers, and workshops to address legal and social attitudes about sexual orientation, gender identity, and intersex issues globally. Please register above with an .edu email address for a significant discount.